When we look at the thoracic spine, we see the individual facet joints. We have a facet joint on the bottom of each thoracic vertebrae and a facet joint on the top. The facet joints on the top are where the thoracic vertebrae will articulate with the bone above and articulate with the bone below. We have the spinous process in the middle of each thoracic vertebra and we have the transverse process on each side. If we think about the individual anatomy of each vertebra, we have different types of bone that actually make up each vertebra. In the anterior portion, or the body of the vertebrae, we have this cancellous bone, which is softer and more honeycomb like. There’s going to be a little bit more blood flow here, and it’s going to help to nourish and protect the discs. In the back, we have this cortical bone, which is thicker and stronger. A lot of that comes from—think of the concept of Wolff’s Law for putting stress and strain through a bone. The body will go ahead and thicken the bone up, so if we have this thick erector spinae group that are pulling through here and gravity coming down and loading the spine, these bones are going to thicken up over time. We have softer bone in the front and thicker, stronger bone in the back. In between here, we have our ribs that are wrapping out and around. Synovial fluid, joint capsules and ligaments are stacked on top of it. 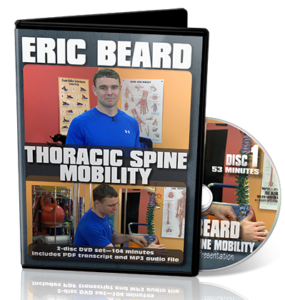 When we’re thinking about thoracic mobility, it’s not just the flexion and extension and lateral flexion or side bending and rotation of each segment, but it’s those segments stacked on top of each other and how they interact with the rib cage. The ribs don’t just start in the back. They also run around to the front. The ribs are going to run into the cartilage—into the sternum. They’re going to come up all the way to the top, so we have an influence from the anterior body that drives what’s happening in the posterior part of the body. Everyone is always thinking thoracic mobility, even locally, that the thoracic spine is driven posteriorly. This is not necessarily the case. As the ribs go out and around, you can have dysfunction anteriorly that will drive it posteriorly. The structure of the thoracic spine is not just the individual bone and what it protects and what it does, but the articulations with the ribs around that and the slightly different jobs the thoracic spine has when compared to the lumbar and cervical.